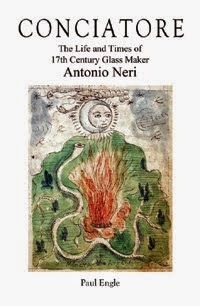 Antonio Neri wrote the first book entirely devoted to making glass from raw materials. L’Arte Vetraria, or in plain English: 'The Art of Glassmaking' did not get written in a vacuum. When Neri put pen to paper for his book, he had been making glass for about a dozen years. He had the opportunity to learn his craft from some of the experts in the field. His first known experience in glassmaking was at the laboratory palace of Don Antonio de’ Medici, a prince from the ruling family of Tuscany. Don Antonio de' Medici's Casino was as much a grand concept as it was a physical space. Completed to his father’s specifications in 1574, it evolved into a prince's palace par excellence. Within its walls, grand dinners were held, productions were staged and poetry was read. In 1605 Michelangelo Buonarroti the younger staged a play there titled "The Christmas of Hercules." In its chambers, music was performed, philosophy debated and diplomacy conducted. In its laboratories, alchemy was nurtured, and glass was formulated. It was a sort of grand royal conservatory, melding together art, letters, drama, music and science. From its courtyard, hunters set forth into the Tuscan hills in search of unicorns, and within its workshops, artisans explored the territory of new materials and natural secrets. This was the way that I made chalcedony in the year 1601, in Florence at the Casino, in the glass furnace there. At that time, the task of scheduling furnace-work fell to the outstanding Mr. Niccolò Landi, my close friend and a man of rare talent in enamel work at the oil lamp. I made many pots of chalcedony in the furnace there. I never deviated from the method stated above, I always prepared the materials well and it always came out beautifully in all my proofs.-Antonio Neri 1612, p. 41.